Howard Johnson Hotel Riverside Grand Island (NE) Grand Island, Hotel null. Limited Time Offer! Of a BusinessRead more category, the Howard Johnson Hotel Riverside Grand Island (NE) has all the comforts such as : Restaurant, Room Service, Bar, Business Center, Laundry.Take advantage of the pool which is available at the hotel.This hotel offers high speed internet.This hotel offers a unique service : billiards.Other useful information:This hotel has a parking. Fee parking, free local telephone calls, 24 hour front desk, handicapped facilities,modem lines in room. no smoking rooms, free newspaper, pets allowed, RV and truck parking and television with cable. 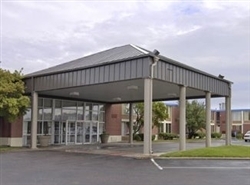 Airport, bus 4 miles Conestoga Mall and several restaurants within walking distance. Stuhr Museum 1 mile.